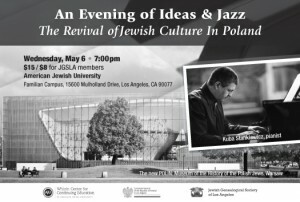 Dr. Sebastian Rejak, Special Envoy of Poland’s Minister of Foreign Affairs for Relations with the Jewish Diaspora presents a lecture entitled Polish Jewry, from Destruction to Revival. Following the lecture, join us for a concert, exemplifying this cultural resurgence, featuring noted jazz pianist Kuba Stankiewicz who performs works from his new album The Music of Victor Young. Young, an American born composer of popular songs and films (Around the World in Eighty Days) began his career as a violinist with the Warsaw Philharmonic. Kuba Stankiewicz, with a catalog of over twenty albums, ranks among the top Jazz pianists in Poland. The American educated Stankiewicz received an Order of Merit from Poland for his cultural contributions and representation of Polish ideals at home and abroad.